Borghese – Fango Purificante Essential Balance & Pore Refining Serum: This ultra light and fast absorbing-serum is especially great for men who have more oily skin. Created with detoxifying and mattifying active ingredients such as naturally-sourced clay, algal earth and phytic acid, this serum controls shine while refining and cleansing pores. After using your favorite toner, only a few drops of this on the face and neck are needed. Follow up with your favorite moisturizer. If you have especially oily skin, concentrate product on areas that tend to have the most shine – such as the forehead and nose. Fango Purificante Essential Balance & Pore Refining Serum retails for $95, and can be purchased directly via Borghese’s main website here. Arbonne – RE9 Advanced® for Men Eye Repair Cream: In clinical studies, 96-100% of men experienced an increase in the appearance of brightness and skin firmness in the eye area after only 1 week of usage. I used this powerful eye cream for 6 weeks and noticed a huge difference in the appearance of my dark circles (something I have had to address my entire life!). This product is great for men looking to address puffiness, dark circles, and fine/deep lines around the eye area. The effectiveness of this product is increased even further when applied using Arbonne’s breakthrough Intelligence Genius Ultra that I recently wrote about here. Arbonne’s RE9 Advanced® for Men Eye Repair Cream retails for $50, and can be purchased directly via their website here. HydroPeptide – 5X Power Peel Daily Resurfacing Pads: HydroPeptide has one of the most advanced science-derived skincare lines I have been introduced to this year. In particular, the (2016 best seller) 5X Power Peel Daily Resurfacing Pads are transformative. Comprised of powerful active ingredients such as glycolic, salicylic, and lactic acid combined with exfoliating peptides and mushroom enzymes, these resurfacing pads facilitate the process of cellular turnover – brightening and protecting the skin from free radicals. As powerful as this product is, it is still gentle on the skin. For more dry and/or sensitive skin, make sure to follow up with HydroPeptide’s Soothing Serum and AquaBoost Oil Free Moisturizer for ultimately hydrated skin. Once you experience HydroPeptide, it is hard to find other skincare products that are as luxurious – let alone effective. 5X Power Peel Daily Resurfacing Pads retail for $68, and can be purchased directly from HyrdoPeptide’s main website here. Kiehl’s – Facial Fuel Energizing Moisturizer: A cult-classic in men’s skincare, Kiehl’s Facial Fuel Energizing Moisturizer leaves the face feeling refreshed, reenergized, and revitalized via the tingly sensation that is left lingering after application. I like using this throughout the day as a “wake up” moisturizer – especially during the humid/hot days of summer. This cooling light blue moisturizer retails for $25, and can be purchased directly at Kiehl’s website here. Super Safety Razors – Parker Fusion Compatible Black Razor & Pure Badger 3-Piece Shave Set: Among all of the other great shaving sets sold by Super Safety Razors, this set is especially practical due to its 5-blade Gillette Fusion razor head compatibility. Being recently introduced to this line, I can safely say their shaving sets are not only top quality, but also look very stately in any bathroom. 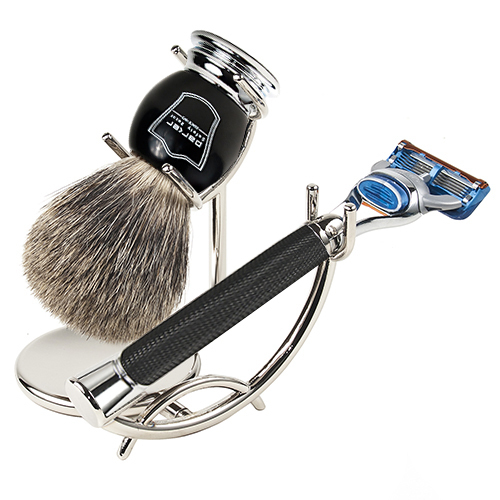 The chrome stand has weight, substance, and functionality – allowing optimal conditions for the handmade Parker razor to dry while extending the usage life of the 100% pure badger bristle shaving brush for many shaves to come. This would make a perfect gift for any husband, boyfriend, or father looking to have a first-class shaving set. The Parker Black Fusion & Pure Badger 3 Piece Shave Set retails for $109, and can be purchased directly from their website here. Gaffer & Child – Shave Butter: For men looking to shave without the need of a shaving brush, Gaffer and Child’s Shave Butter is the way to go. This latherless shea butter is infused with nutrient-rich organic sea buckthorn, lavender, and lemon essential oil – all of which provide for a close, moisturizing, and luxurious shave. Create a spa-like experience by placing a hot towel over the face and neck prior to smoothing this product over desired shaving area. In addition to the impressive effectiveness of this product, I love its soothing/calming fragrance! Gaffer & Child Shave Butter retails for $30, and can be purchased directly from their website here. 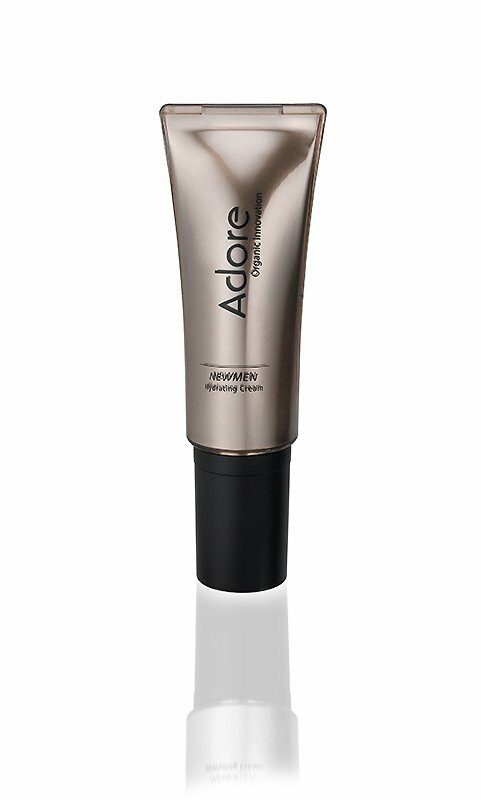 Adore Cosmetics – NEWMEN Hydrating Cream: To be used after shaving or whenever your skin is feeling dehydrated, this organic luxury hydration cream is an essential. Not only does it leave your face feeling restored and refreshed, but also utilizes the brand’s youth-preserving exclusive plant stem cell formula marketed by Adore Cosmetics as “the most advanced anti-aging biotechnology for skincare” – differentiating the brand and setting it apart from other organic luxury skincare providers. NEWMEN Hydrating Cream retails for $110, and can be purchased directly via their main website here. Skin Research Laboratories – NeuHAIR Hair Enhancing Formula: I have only been using this breakthrough product for 2 months, and the difference in the way my hair looks and feels is incredible. This foam-like formula is enriched with silk-amino acids, biotin, sweet almond oil, and a powerful blend of polypeptides – all of which contribute to the appearance of fuller-looking, thicker, and stronger hair. This product even restores hair that has been moisture-stripped via straightening, curling, coloring/bleaching, poor diet, and aging. 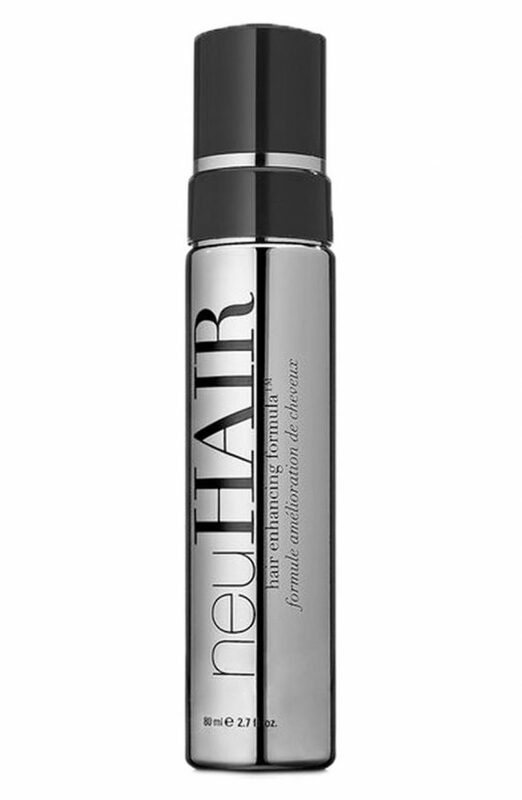 NeuHAIR Hair Enhancing Formula delivers (clinically-proven) results and can be purchased for $150 directly from their main website here. BLACKWOOD FOR MEN – Cooling Clay Facial Wash: So often clay-based facial washes leave your face feeling taut and dehydrated – this is not one of them. Infused with tanakura clay, activated charcoal, palm kernel oil, and lauric acid, this refreshing face wash has powerful anti-aging properties and leaves your skin feeling cleansed without that overly dry sensation. BLACKWOOD FOR MEN Cooling Clay Facial Wash comes in three sizes ($19 for the 8oz standard size) and can be purchased soon via their main website here.